A monthly impression of Bosvathick! Please click on each month for a short description. January, the first month of the year after the Christmas parties with lots of food, warmth and light, can leave us somewhat forlorn at times. 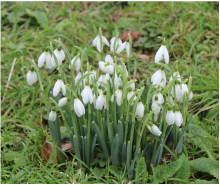 Therefore it's most exciting that in Cornwall, due to it's mild climate, glimmers of hope are already appearing everywhere in the garden, reminding us that spring is just around the corner. As a matter of fact, a garden in Cornwall is never really in hibernation. We have early flowering camellia varieties already displaying some colour, so it's not only the well known snowdrop that is bringing us January joy. Scented sarcococcas, mahonias, the first primroses, early crocuses (or croci) and sometimes even a flower or two on a perennial plant that forgot to take a winter rest. So garden-wise not such a grim month after all. In February many shrubs in our garden are preparing themselves to burst out their yearly display. More camellia blooms are opening, some of the shrubs flowering for up to six weeks, giving us many weeks of colour pleasure. More crocuses appear along our drive as well and narcissi are showing green growth through the grass everywhere. In 2015 we had our first azalea flowers appearing as well in this month, which we personally hadn't seen before. Many more primroses are emerging everywhere; we have left them to self seed for quite a few years now and in their peak time, which is March/early April they are carpeting many areas in the garden, an absolutely beautiful sight. Other interests are Helleborus of course, the red pins on the Skimmias and one of our other favourites the Stachyurus Praecox. Now the garden is really well on it's way. 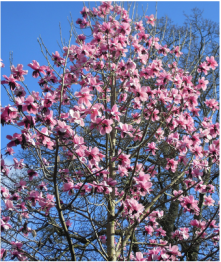 Our wonderful magnolia tree is loving it's position on our south lawn, nicely sheltered from most winds, it is smothered in huge pink flowers well visible from the drawing room and one of our B&B rooms as well. Jetfire and Tete a Tete cover the banks of our garden enfilade which ends with over 20 metres of narcissi Ice Follies in the middle of the orchard. More camellias, primroses, bergenias, the last of the croci and the first rhododendron flowers, there is always something to see. We also like to create a wonderful bulb display in pots all around the house, so you might see iris, giant hyacinthus and tulips of course. For more pictures see our March 2015 blog. From April onwards the garden is really stunning at Bosvathick. 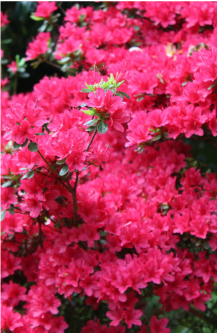 While April and May will give you the true Victorian/Cornish garden experience, the rhododendrons, camellias and azaleas make way for all the beautiful herbaceous borders in the summer months. 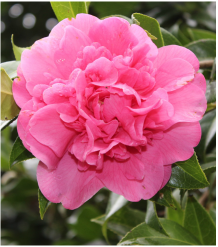 Anyway, in April some camellias are still going strong, but it is really the glory time for rhododendrons and kindred varieties like the azalea. End March and early April sees the best of the primroses while end April is the start of the wonderful bluebells throughout the garden. The start of the cherry and apple blossoms, blooming skimmias... simply said, colour everywhere and not to forget beautiful scents from rhododendron Lady Alice Fitzwilliam for instance and several viburnum varieties. In May the amount of colour and scents in Bosvathick's garden is simply indescribable. Wisteria on the house with the first hints of scented jasmine, rhododendrons and azaleas throughout (of which many are scented). There are also bluebells and spring perennials, it is hard to do this month justice in a short write up. Apple blossoms stir the excitement of an autumn produce, bumble bees buzzing everywhere, newts in the fountain pond, tadpoles in the lake, birds nesting, we could go on and on. Last but certainly not least we'd like to mention the stunning beech trees that are flanking our drive and are dotted throughout the estate. The green and coppery colour of spring leaves on mass is mesmerizing, especially with dappled sunlight beaming through their canopy. Sometimes one needs to look up when exploring a garden too. June is the start of a whole new garden season at Bosvathick. Over the last few years we have really worked hard to extend our season of interest and June nurtures the start of our summer display. The first 2 weeks of this month we call: pink & purple picture perfect! 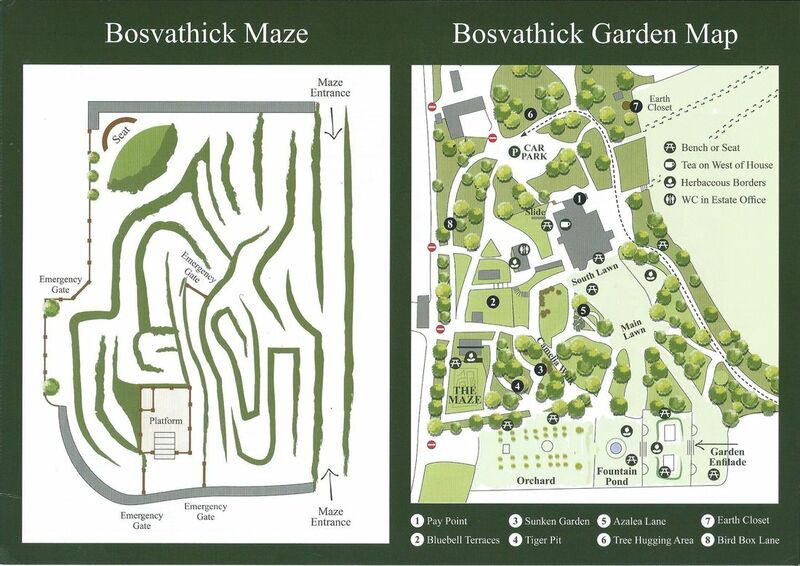 We don't mean however that Bosvathick is all about perfection with excellent laid out paths and every nook and inch completely planned. It merely describes the beauty of something more wild; it's the result of allowing plants like moss campions (Siline Acaulis) and common foxgloves (digitalis) to take their place in the garden with the purple of ponticum in the backdrop. Simple yet stunningly beautiful! That's not all that is going on in June of course. In the latter half of this month the perennial borders are taking the lime light and will keep this spot until the Autumn. We have water lilies in the pond and lake, and many other shrubs and trees like the scented Philadelphus and the Chilean Fire tree. One plant variety deserves to be mentioned separately of course and that is: the rose. 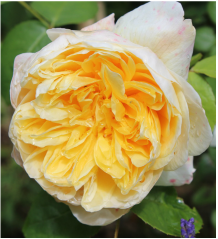 We already had quite a few climbing and rambling varieties covering the estate office and 'castle' wall, but we have added many more since, among which many shrub roses with excellent repeat flowering qualities, giving us beautiful flowers and scent far beyond our closing date at the end of August. July is really a continuing of what June instigated but in an even bolder way. With roses still in bloom and wonderfully contrasted with pinks, white and purples of other perennials like geranium Rozanne, stachys, aconitums and many more, our terrace borders really deserve the eye of bench-sitting onlookers; hence the well placed seats on each side of the garden enfilade. 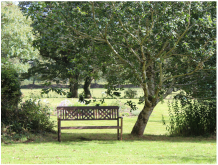 With the trickling water of the fountain pond in the background, views across the fields and birdsong in the air, this is a favourite spot of the garden for many, also great for some book reading or life pondering. For wildlife there is plenty of choice as well, among which buddlejas for the butterfly and for our reds and yellows we have our 'hot and spicy' coloured blooms like heleniums, monarde and kniphofia. Many visitors and B&B guests have described the garden as 'romantic' and we couldn't agree more. This is the last month of the year we are open to the public but there is still a lot going on. 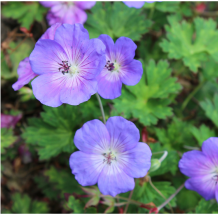 Perennial borders are filled with flowers like japanese anemones, not to mention agapanthus, rudbeckia and other plants like asters and many penstemon varieties as well. We also have hydrangea shrubs throughout the garden. Some start flowering in July already but the laceheads seem a bit slower and carry through way into August. We are also very excited to harvest our first apples in a year or two. In 2013 we planted Bosvathick's orchard, 31 apple trees among which, two 'Beauty of Baths'; a very early apple variety which should give a wonderful red display in the orchard in August. In short it's a wonderful month to come for a languorous summer day. Bring a picnic blanket and a sandwich and there are cold drinks and teas & cakes available for purchase. A perfect day in a great location and with a bit of luck some blackberry picking as well. September is the first month we are closed. Even though many plants are still in bloom, this is the month we start preparing for next year's opening. Benches and wooden carts, statues and other ornaments will be put in storage to protect from the winter rain. Some seats and benches remain for the family's use of course, as the garden is still very beautiful at this time of year and Cornwall tends to have many sunny September days. This is also the month for bulb planting. We intend to slowly expand our spring bulb display each year, building up to a 'visit worthy' March opening. Due to the grey squirrel we are limited in our choices, but even daffodils and crocuses on mass are very stunning indeed. More apple picking this month. 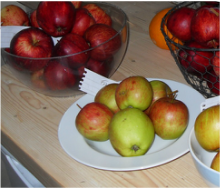 Our other orchard apple varieties will be ready for harvest between now and half November or so. Eating, juicing and cooking and hopefully storing as well. Sycamores turning brown and shedding their leaves with other deciduous varieties soon to follow. October is a season change-over month. But still, like many other gardens in Cornwall, Bosvathick stays relatively green in the winter. 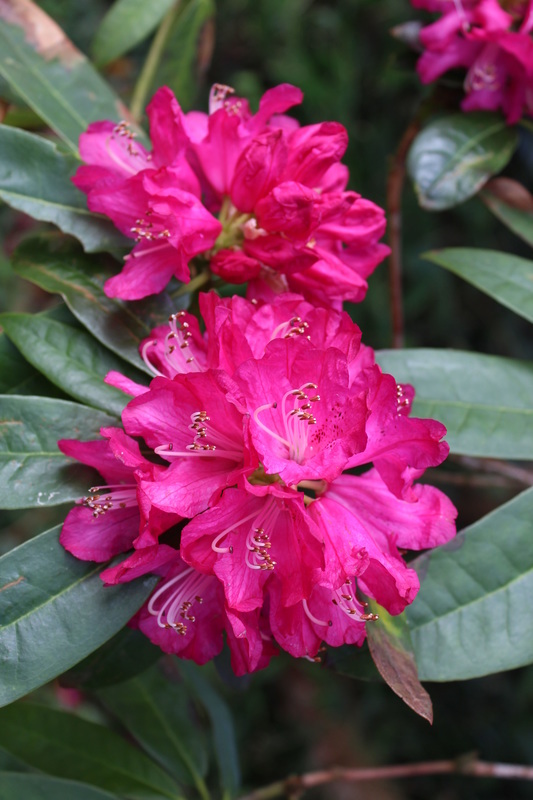 Rhododendrons, evergreen azaleas, camellias, laurel, conifers, spruce and other varieties all keep their colour and if the dry weather cooperates, some wonderful garden strolls are happily made by the family on a weekend day, followed by scones or crumpets and a log fire of course. November is a difficult month. Often it is very wet and it is hard to do landscaping jobs due to water logging etc. Picking the last apples will be on the schedule and perhaps the start of some winter pruning. There won't be many flowers at this time of year, even though in 2014 we still had some coreopsis and flowering 'weeds', and an early start of a December flowering camellia. So Bosvathick is never really short of some colourful blooms. More pruning this month of course, also for holly branches and other greenery for an indoor Christmas display on the family dining table. I guess our focus in December is more indoors than outdoors; whatever is in flower needs to be close to the house to be enjoyed, and winter scented shrubs have to be near a pathway to the sheds or next to the car park to be fully appreciated. Weather permitting we like to always take a family walk through the garden though, especially after the Christmas meals, but they are more about fresh air, a little exercise and some blowing off steam for the little ones. 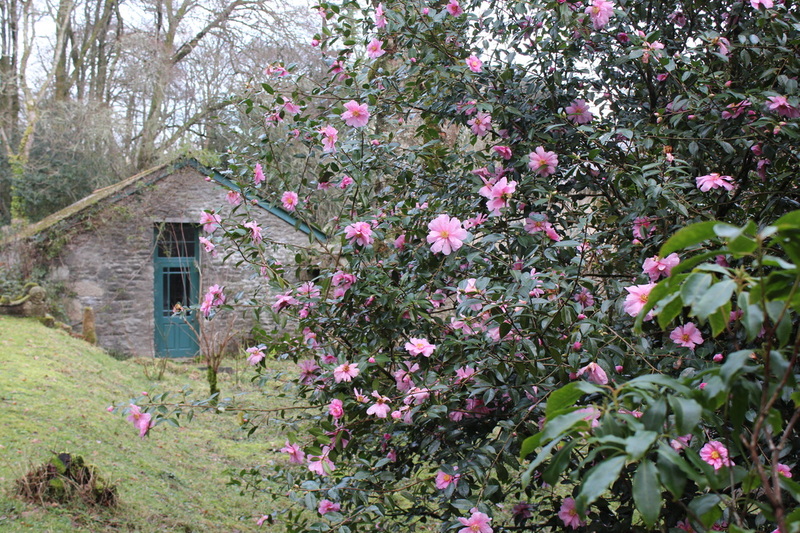 However it remains to be said that year after year the early flowering camellias, which can be real show stoppers with everything else looking so dormant and bleak, can still manage to draw out our wonder and admiration of such beauty in the midst of the short winter days.